Finding Dory had a lot going for it being a sequel to Finding Nemo. Following up on a movie with beautiful imagery and such a great story, could Finding Dory stack up to its predecessor? I say yes, it did! Sure I will still pick Finding Nemo as the best of the two but this was close to being equal with it. 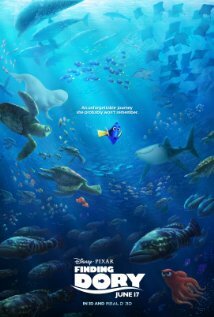 This time instead of Finding Nemo (Voiced by Hayden Rolence), we get to follow our always forgetful aka short term memory loss blue fish, Dory (voiced by Ellen DeGeneres) in her own adventure. She gets flash backs of her own family, her mother and father. She wants to swim across the sea and find them, but Nemo's dad, Marlin (Voiced by Albert Brooks) tells her that her family is with them and that she should just stay. Then at one point Dory asks him if he's ever missed someone, and of course he says yes because of the previous movies events and decides to help her. We get to meet new creatures, some scary, some helpful and not, and others really funny along the way. Dory retraces her steps with flash backs that eventually leads her back to a marine rehabilitation/aquarium for different types of sea species. It is there where the real adventure is and without the help of an octopus named Hank, (voiced by Ed O'Neill) it would be impossible to get anywhere. We also get to meet an old friend of Dory's, a whale by the name of Destiny. Finding Dory is a must-see for all families, young and old. There are some tender moments throughout the film so prepare to hold back some tears. Pixar has yet again created a great story and also with amazing visuals of the ocean. Will Dory find her family? Or will she settle with Nemo and Marlin? Also, if you're not in a rush wait until the very last of the ending credits and old familiar faces from the last movie will appear.